Wouldn’t it be fun to run your fingers over those beautiful ridges? I think one of many limitations with interacting with wildlife is that we can’t use enough senses. It’s pretty hard to do photography without sight and it just occurred to me that I take that for granted. Hearing amazing sounds, like the call of the loon, definitely enhances the experience. The unexpected grunts of bison leave me wondering what exactly they are trying to communicate, if anything. It’s hard to incorporate those sounds into photos. As a kid I used to enjoy scratch and sniff books – maybe that could be enhanced to scratch and listen! I don’t ever recall being close enough to wildlife to smell them and perhaps that’s for the better. I’m guessing after getting enough to eat and avoiding predators, cleanliness isn’t high on the list for most creatures. On the other hand, nature has its own unique fresh smells like meadows and forests immediately after a spring shower. I am often reminded of smells when I look at a photo – a sense that obviously doesn’t connect with viewers who weren’t there. Could you resist a little tug on that goatee given the chance? The sense that I’m really missing out on is touch. My opportunities are limited. Some animals would theoretically be a lot more touchable than others. Certain species, like people, definitely aren’t the touchy, feely, hugging type. I’m happy to leave creatures like snakes and porcupines at a safe distance. Even the garter snakes we handled as kids left me clammy, cold and disinterested. However, if the risks were eliminated, some others would be really tempting. The horn on a Rocky Mountain Sheep has a fascinating texture – I can imagine running my fingers around the curve to feel the ridges and doing it again. 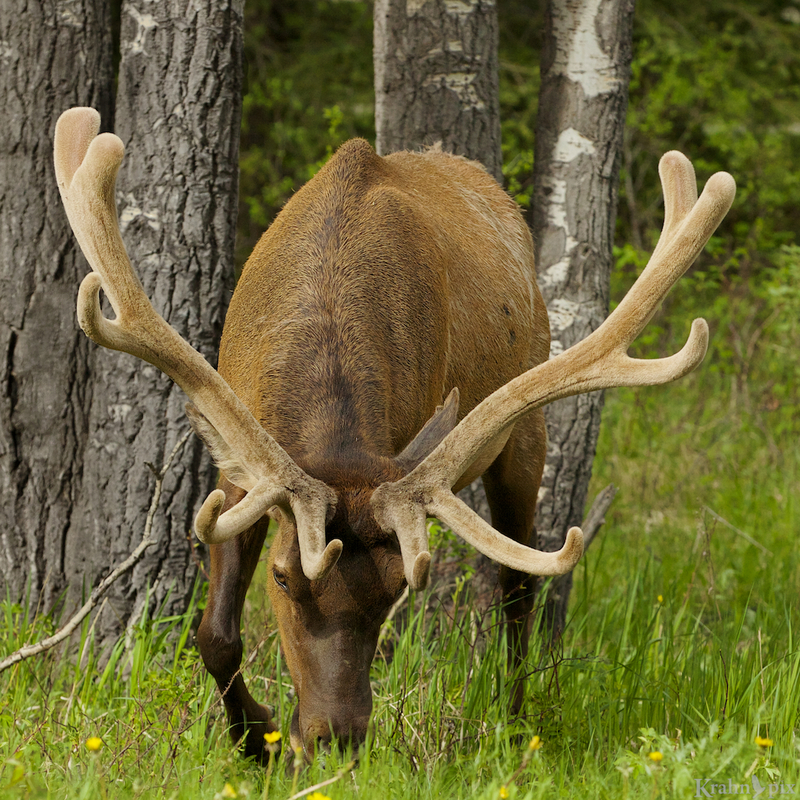 And who wouldn’t want to feel the velvet on the antlers of an elk? Is it as soft as it looks? I’d probably pat a moose’s nose and please don’t tell me you could avoid the temptation of tugging on the goatee! Yes I think I’m really missing out on touching wildlife. What animal would you like to touch – assuming, of course, there were no repercussions? What does that velvet feel like? Is it soft? It might depend on how hard the antler “touched” you! Snakes are incredible to hold. When they move you can just feel that pure muscle – and they’re not slimy at all, despite what people think! I’d like to let my finger run along the legs of a millipede.Horns, as you mention, are also interesting in many ways. What really struck me in these photos, though, was the eye of the Rocky Mountain Sheep. Incredibly interesting! You have some interesting choices – I hadn’t thot of the muscle feel of the snake but that makes sense. I too like the eye of the Rocky Mountain Sheep – an intriguing part of a great creature. I’ve always heard that grizzlies smell horribly. I have no desire to ever test the truth of that claim. Your photos capture texture fantastically. I suspect more than a few animals smell less than pleasant. It’s fascinating the difference that textures can make and really enhance a photo. I’m glad you like the wildlife. Through a combination of dogged pursuit and lots of luck, I have been quite fortunate in the collection I have gathered. The natural habitat is a bonus. I appreciate the comments. OK I’m seriously jealous on the young lion cubs! That sounds amazing. It would be wonderful to touch the animals in our photos, but I have to say the ones you shoot scare me a bit. The baby bears in a previous post of yours look so cuddly, but that is one animal I would be miles away. Your photos are always so wonderful, it looks like you are close enough to pet them. I do like the magic of the telephoto lens to bring animals in close. That puts the fear factor into perspective. I had temporarily forgotten about the black bear cubs – those would be amazing to touch as long as there were no repercussions of course. Glad you like the photos (even with a few scares). I wanted to ride an elephant and a camel, and did, and the elephant’s skin surprised me by how rough it was–I knew “wrinkly”, but hadn’t expected “rough”. (The camel surprise was its rolling, gliding ride–it felt like being on a boat–one could fall asleep–but its coat was rough.) I wanted to pet a rhino, and did, and THAT surprise was how SMOOTH its skin was–not silk, but definitely soft-ish–it gave under one’s hand pressure, and the rhino loved getting petted. Who would have guessed? As for large cats, we grew up with a dead leopard’s skin in our house, as a rug (nasty). My father had shot it in India (nastier). The fur was extremely harsh–prickly–I could get a rash from it, just from scooting around on it too much. A soft surprise was petting a goose-duck (half each). The goose half wasn’t eider, but he felt like it. Lush and silky both. Lovely. A sound surprise was my baby mallard (kept temporarily, when I was a child). I hadn’t known before that baby ducks “peeped” rather than quacked! Last, am with Steve Gingold–love holding frogs and salamanders–they are the cutest, with their dark eyes and soft little bodies. But know they don’t like being held, so try awfully hard to resist (most of the time), now that I’m supposedly wiser with age (and now that a lot of them are endangered). Gosh, have blathered on and not even mentioned your pictures–What Phil Lanoue said about that last one–terrific. OK – you win the prize for touching the most interesting animals and giving great descriptions about the experiences. I must be missing something to not share your interest in holding frogs and salamanders but we’re all different I guess. Glad you enjoyed the photos. That massive creature lives on grass. Isn’t that amazing. That must mean that every nutrient that he needs is in the grass. That truly is amazing. If I had never seen that work before, I would probably never believe it. It makes sense to want to touch the animals you like. The sounds really are special and add so much to the experience. Congrats on being the first one to mention the sense that I purposely avoided – taste. Great story on that – most boycotts don’t last nearly that long. I always find myself wishing I could touch the animals I am photographing. I am glad to now that I am in good company! Interesting – and I was wondering if I was alone. Marvelous photos as always. While I’d love to be close enough to any and all animals to be able to safely touch them, I recently saw a photo of a lynx whose size surprised me, but whose furriness didn’t. I’d happily snuggle with one of those softies. Thanks. Those larger creatures in the cat family are most definitely interesting creatures. Lynx is a great choice. I love handling serpents, but for animals that I’ve never touched before? Owls. That soft, lovely plumage is just begging for it! Yes the owls do have a downy plumage that looks better than a pillow. No problem agreeing with that one. I think I would want to feel the velvety Moose. Now that I think about it a little more, it would be interesting to touch most animals. My favorite memory is touching a hummingbird. We had a huge sliding door to a shop building and a hummingbird was trapped inside. For some reason, he kept trying to fly up instead of dropping down to the opening where he could get out. Eventually he exhausted himself trying and went into a torpor. I very gently picked him off the rafters and set him down outside with some sugar water nearby. Then guarded him until he recovered enough to fly off. What a thrill that was! I’m not sure I can think of anything to beat it. If you’re interested there’s a hummingbird nest cam at: http://www.ustream.tv/hummingbirdnestcam The first babies just hatched today. You get to watch mom feeding them. That’s a great story. I can certainly understand what a thrill that would be. Thanks for telling it. I tried the humming bird link but it probably works better in daylight hours:) I’ll be back. I’ve been watching her feed at least two chicks today, but it sure gets windy at times. Hope you get to enjoy watching them grow. Yesterday I could see just one chick and an egg, so apparently the egg must have hatched overnight or early this morning. I keep a tiny screen open with just the webcam in the corner and you can hear momma taking off or coming back to the nest if you have the volume up. Great thought question…Can’t decide but my greatest wildlife experiences always involve copious input from multiple sensory organs. Like a the smell of the sea with the noise and sight of giant flocks of birds. Wonderful photos and I would like to indeed touch the horns on the ram. So true – multiple senses really make the experience so much better. It’s one of the main reasons I think we all look at our photos differently since we were there! Lyle, totally agree especially on the idea of how we each feel about our own photos. A bad “photo” with a great memory is a great photo. A tiger would be quite something! Glad you liked the images. Oh I definitely want to pet Mr. Moose! I bet he would love a nice scritch between the ears, uh, I mean the antlers. Super photos too! I thought those antlers in the last pic were going to poke my eye out. I figured you’d be tempted by the moose though a little surprised you didn’t want to feel a gator! Glad you liked the pics. Wonderful photos and another great narrative! Glad you like them. I had to do something with those textured shots. I would like to touch a crane and many other birds. But, I know this isn’t quite possible. Glad you like the photos. I hadn’t thot of a crane but that’s a good one. I’ve always been intrigued by the hole in the beak. Beautiful, touchable images. You did an incredible job in capturing the textures of these beautiful animals. I’d be thrilled if I could touch a cheetah. The speed and strength, the colorful pattern and the long tail–I’ve always been fascinated with cheetahs. Thanks. Textures can sometimes add a lot to a photo. The cheetah would be an interesting choice and give a lot of reasons to like. Perhaps an African safari is in your future.